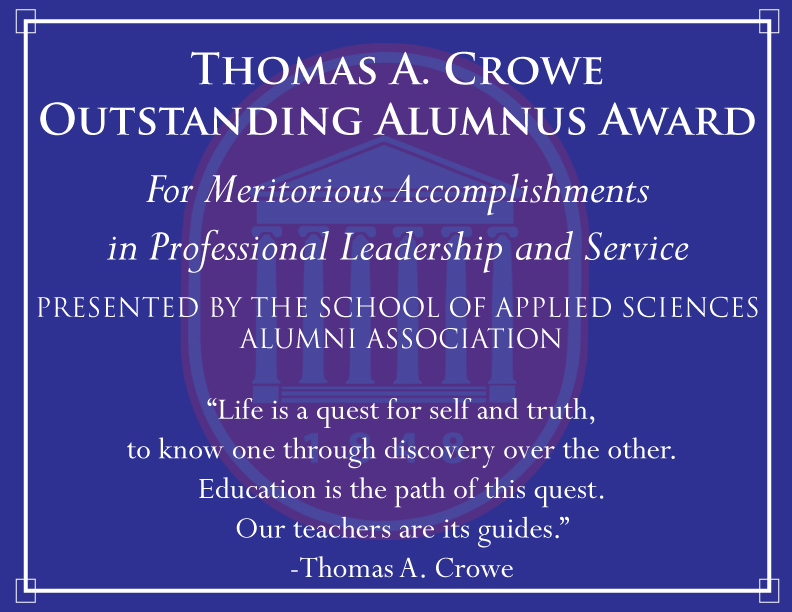 The School of Applied Sciences seeks nominations for the Thomas A. Crowe Outstanding Alumnus award. This award acknowledges an alumnus whose professional, leadership, and service achievements are considered meritorious. Letters of nomination will be accepted from the School of Applied Sciences students, faculty, staff, and alumni. The nomination letter should be a maximum of two pages in length and the narrative should describe the nominee’s exceptional attributes. The award is named after Thomas A. Crowe, professor emeritus of communication sciences and disorders and the first dean of Applied Sciences. Crowe was a three-time recipient of the Outstanding Teacher Award and retired as dean emeritus of the School in 2005.